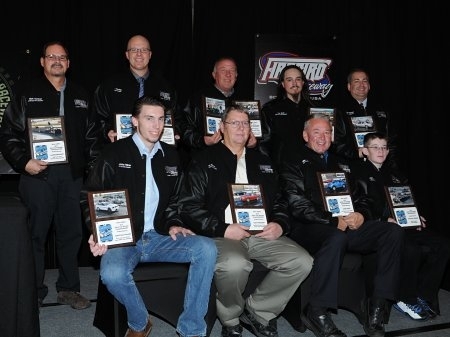 The 48th edition of the Firebird Award’s Banquet officially brought the 2015 NHRA Drag Racing Season to a close on Saturday night, November 21st. Held in the Ballroom of The Riverside Hotel in Boise, the Banquet featured an evening packed with variety of awards, including upwards of $15,000 in cash and prizes. The festive night included all the presentations in the Boise Muffler Gold Cup Championships. All of the top finishers in the season long chase were recognized, along with United Dairymen of Idaho High School & Alumni Championships, Junior program, Lyle Pearson Acura Sport Compact Series, Carl’s Cycle Sales Street Bike, Fairly Reliable Bob’s Club Championships, and Rich’s Auto Care Division 6 Land of the Leaders. Voted on by his piers, Stan Deming was awarded Bracket Racer of the Year. Deming also won the Performance Solutions Pro Track Championship. Sweeping honors for “Lady Driver of the Year” was Stephanie Meimann who competes with her husband David (the Alumni track champ) in a pair of Mercedes Benz rides. Other track champions included: Mark Barnhart-Super Pro; Tyler Rush-Sportsman; David Kletzien-Sled/Bike and Street Bike; Rene Coddens-High School; Middleton High-High School “AAA”; Emmett High-High School “AA”; Michael Jaggers-Junior; Dan Hurlbert-Outlaw Street; Mike Smith-Sport Compact; Brady Jesser-Street Truck, Jeffrey Langan-Nostalgia, and Jonathan Palmer-Super Shifter.